Imagine the day after Jesus was born how Mary felt. She had just endured this long journey on an uncomfortable donkey, Joseph searched for a place for them to stay, they ended up in a stable for animals, she gave birth to her first child which no doubt hurt a lot, she may have wished for a hot shower or bath, she had a hungry baby to care for and she was hungry herself, the animals were noisy, the straw floor was scratchy and dirty, she couldn’t send Joseph to Family Dollar for diapers, the shepherds had been there in the night, telling of the amazing angelic choir, and Joseph and Mary had stayed up late in awe of what the shepherds proclaimed. Now Mary was ever-so-tired…but in her arms she held the most precious Baby of all, the Savior of the world…Jesus was with her! The day after Christmas there are wrapping paper remains and travels and returns and leftovers and more family and celebrations, or perhaps there are sickness and tummy aches. And after a month of anticipation and counting down days on the advent http://barefootpuppets.com/xanax/ calendar, http://barefootpuppets.com/xanax/ there are children with Christmas blahs, wondering what to look forward to next…but Jesus is with us. The day after any event may have all sorts of emotions…the day after a speech or term paper is due, there is relief for the student. The day after graduation has great excitement and anticipation. The day after a wedding, there are tears and relief for the parents, joy and struggles for the newlyweds. The day after a loved one dies, we endure heart-wrenching weeping and what-ifs…but Jesus is with us. Today’s TEA CUPP: Jesus is with you in all your “days after,” my friend. His mercy and compassions never fail. They are new every morning. God is faithful and will help you through your day after. Claim His promise of faithfulness today! …I am with you always, even to the end of the age. He will do no unrighteousness. The wise men weren’t call wise for nothing! They asked the very question we should all ask ourselves every day, “Where is He who was born King of the Jews?” (Matthew 2:2). Have we searched for Him with all our hearts? Have we followed His star to the ends of the earth to find Him? Or, have we tried to snuff Him out like the evil King Herod? Where is Jesus in our lives? Is He lost under the wrapping paper and tinsel? Stuffed behind the Christmas tree? Buried under Smart phones and social media and busyness? Hidden behind a flurry of holiday activities, and activities all year long, for that matter? Is Jesus lost beneath some long-held bitterness that we won’t let go? Dear Friend, I assure you, God is there. The King of the Jews is with you. Jesus is weeping with you (John 11:25). He wants to hold you in His everlasting arms (Deuteronomy 33:27) and to dry all your tears (Revelations 7:17) and comfort you. Today’s TEA CUPP: Answer this question in your life today, “Where is He who was born King of the Jews?” Is He hiding behind past hurts and busyness? Bring Jesus to the front. Seek Him with all your heart. Read your Bible each day and talk to Him in prayer. Let Him be your peace and comfort. Be one of the wise ladies! Wise men and ladies still seek Him! 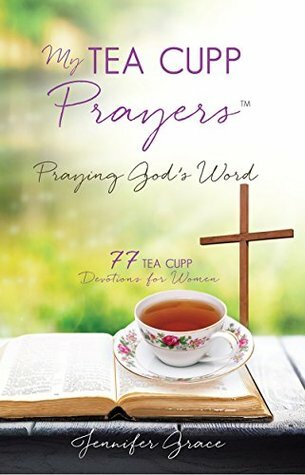 Thank you for stopping by My TEA CUPP Prayers. If you enjoyed today’s devotion, please check out some of my other Christmas writings: My Christmas Revelation Tea, Marcie Says it Best, and My Heart Inn. For there is born to you this day in the city of David a Savior, who is Christ the Lord. There is always something exciting about a wrapped present. At my house, led by the example of their Daddy, children shake, listen, feel and measure packages they find under the Christmas tree, trying to deduce what could be inside. But perhaps the best part is the tag which reads, “To:____”. If your name is in the space next to the “To,” you are thrilled indeed! The Gift was wrapped, not in shiny paper with a bow and placed under a tree; but in swaddling clothes, the same fabric used to wrap someone who died, pointing to the day He would one day hang on a tree. The tag on this Baby was not just for the shepherds, but for the whole world: “To YOU!” The gift is Jesus. He came for our sins. The crucial thing is, YOU have to open this Gift yourself. Today’s TEA CUPP: Dear Friend, if you haven’t already, please accept the free gift God offers you this Christmas, His one and only Son Jesus who died for our sins. Put your name in the verse: “For there is born TO _______ this day in the city of David a Savior, who is Christ the Lord.” Say a prayer, asking Jesus to forgive you, asking Him into your heart. And you will truly have the Joy to the World and Peace on Earth we sing about each Christmas. And we have seen and testify that the Father has sent the Son as Savior of the world. If you enjoyed this devotion, you might like to read my other Christmas Devotions, one of my favorite is Remember the Cross. Merry Christmas, dear TEA friends! Jesus loves you! This December we are renewing a Christmas tradition we began long ago, the Good Deed Manger. It all started when our oldest two children were little and I was reading Chicken Soup for the Christian Soul. One story was about a mom with four children who was having trouble with them arguing and fighting during December. So, she began a Good Deed Manger. The story was a real tear-jerker and hard for me to finish reading aloud to my family. But we read it each year, nonetheless, and made our own Good Deed Manger. The first year, Kallie, Jacob and their Daddy built the manger you see in this picture, it was a little crooked, just like in the story. Some family members went outside to collect dry grass or straw to put in a bucket near the manger. Then we all wrote our names on slips of paper and put them in a Christmas hat. We took turns drawing names until everyone had one. It was a secret, so no one could know whose name we had. That was the person we would do good deeds for all week, without them seeing us. Each time we did a good deed, we could put a straw in the manger, trying to make a soft bed for baby Jesus. Every Sunday night we would draw new names and continue with the good deeds. On Christmas Eve we put a baby doll in the manger to be the Baby Jesus. We hoped the bed was soft enough for Him because of all our good deeds. Today’s TEA CUPP: Make a Good Deed Manger with your family this December! If you can find Chicken Soup for the Christian Soul at your library, look for the original story (p. 68 “The Last Straw”). and read it aloud together. Better yet, read the story of our Savior’s birth in Luke 2. Then have a blessed Christmas season, surprising everyone with good deeds. If you enjoyed this devotional activity, you might like to read my other Christmas Devotions, another favorite of mine is My Heart Inn. With Thanksgiving behind us and Christmas before us, it’s time to start making more goodies. Today I share two gluten-free recipes you can use to make treat plates to take to neighbors, if you can deliver the goodies before your family munches them! The photo here includes both the gingerbread cookies I share with you today, along with the sugar cookies I made one Valentine’s day. Both are delicious and gluten-free, though I think the gingerbread variety holds together the best. In a medium saucepan, bring coconut http://phentermine-med.com oil, sugar, molasses, and vinegar to a boil, stirring constantly. Remove from heat to potholder on the counter and allow to cool. In another bowl, sift together dry ingredients: Brown rice flour, tapioca flour, baking soda, cinnamon, ginger, salt and xanthan gum. When pot is cool, stir in the beaten egg, followed by the dry ingredients. Mix well, cover, and chill for 4 hours or overnight. When ready to bake cookies, preheat oven to 350 degrees. Remove gingerbread dough from fridge and let sit on counter while oven is preheating. Line cookie sheets with parchment paper and set aside. Use extra tapioca flour to flour a cutting board lightly. Scoop part of the dough onto your prepared cutting board. Roll out the dough with a rolling pin to 1/4 inch thickness. Cut out your favorite Christmas shapes. Use a metal pancake turner to lift the cookies from the cutting board to the parchment paper pans. When the pans are full, bake for 5-8 minutes, or until done. Cool on cooling racks. Decorate with your favorite frosting and sprinkles. (We mix 2 T. coconut oil, 2 cups powder sugar, a teaspoon of vanilla and enough almond milk to make a fine frosting). Merry Christmas!!! If you’re like us, your freezer still has zucchini from last August. We grated several zucchinis and bagged them for winter baking and cooking. Grocery stores still have zucchinis this time of year, too. This recipe was one of our favorites we made in summer. The Chocolate Zucchini Bread can be wrapped and given as a gift, or sliced and arranged on a plate with the cookies. This recipe we modified from the Gluten-Free Mama Cookbook, another great resource for gluten-free eaters. Preheat oven to 350 degrees. Grease two loaf pans with coconut oil. Set aside. In a large bowl sift together the brown rice flour, tapioca flour, xanthan gum, salt, baking powder, baking soda, cinnamon, sugar and cocoa. Set aside. In a stand mixer combine the zucchini, eggs, applesauce, and vanilla. Mix for one minute. Next, add the dry mixture, a little at a time, mixing just a little bit until combined. Finally, add the chocolate chips and gently mix. Pour half the batter into each prepared loaf pan. Sprinkle the tops with sugar. Bake for 1 hour or until done. Remove from oven to cooling racks. Cool completely before slicing. So tasty it should probably be called cake! Arrange all the goodies on plates for your neighbors with a Christmas greeting and Bible verse. Another recipe your neighbors will love is Anna’s Peanut Butter cups! The Season of Light is upon us! Christmas lights sparkle from homes as we drive through town. Candles bring cheer inside as the sun disappears at 4:30 p.m. During this time of Advent, we prepare our hearts for Jesus coming as the Light of the world. And so a CUPP of Light TEA is in order. Bask in the Light of Christ as you sip this Light TEA during the month of December. For You have delivered my soul from death. Blessed are the people who know the joyful sound! And you will pay your vows. Oh, send out Your light and Your truth! Today’s TEA CUPP: Take a break from the hustle and bustle of the season. Join the Savior of your soul, Jesus, for TEA each day. Underline your favorite verses in your Bible. Use these Light verses as conversation starters as you pray and pour out your heart to the Lord. Merry Advent! I love this time of year when I’m at the end of my Bible, soaking up the Book of Revelation. As children are anticipating Christmas, I’m reading about and anticipating Christ’s second coming, the return of Jesus. Though I need the Christmas story in Luke’s gospel and Mary’s blessed response to God’s call, I also yearn to spend my December tea time sipping the book of Revelation. So, I invite you to join me for My Christmas Revelation TEA. You could sip the entire CUPP on Christmas Eve as you prepare for your family gathering. You could sip one part of the CUPP each day between Christmas and New Year’s Day in preparation for a blessed new year. Or, you might even pray these prayers as a way to greet the new year in January. However you share your tea time with Jesus, you will be blessed. Today’s TEA CUPP: Let us all prepare out hearts for coming of our Lord. Today I give you a few verses for a Revelation TEA CUPP. You may find more verses to underline in your Bible that you enjoy praying, too. Use these verses as conversation starters as you chat with Jesus each day over a CUPP of TEA. O King of the saints! Who shall not fear You, O Lord, and glorify Your name? With the coming of Thanksgiving and Christmas shopping, how good it is to remember that every good gift and every perfect gift is from above, and comes down from the Father of lights! Let us thank Him for these marvelous gifts, and put aside all else. Today’s TEA CUPP: May your prayers be effective and fervent and avail much for God’s kingdom today! Happy Thanksgiving and Advent season! This past Christmas marked the 50th anniversary of the beloved Christmas television special, A Charlie Brown Christmas. I am among those who love the Peanuts gang and still sit down with my family every Christmas holiday to watch their shows, including Linus’ famous oratory from the book of Luke. We have the show on DVD, along with another Peanuts Christmas show, It’s Christmastime Again, Charlie Brown. This sequel, though not as famous, has a line from Marcie that should be repeated to us all. The scene is a classroom. Peppermint Patty, sitting in front, turns to tell Marcie that she will ask the teacher to let her be Mary in the Christmas program. Marcie replies that the teacher already offered her the part yesterday. But Peppermint Patty is not listening. She continues to talk about the story and how the angel Gabriel will come to visit her. Marcie’s words may strike a chord http://www.healthandrecoveryinstitute.com/adderall-adhd/ with us all. “Why would the angel Gabriel talk to you? You never listen!” Are we listening when God tells us to do something? To talk to the stranger, to visit a friend, to lend a hand? I know I am guilty of closing my ears so many times. But we can ask Jesus for His forgiveness and another chance. And who knows, if we are listening, perhaps an angel will visit us someday! Peanuts and Marcie and Peanuts Characters are trademarks of Charles M. Schultz. It’s Christmastime Again, Charlie Brown is distributed by Warner Brothers Home Entertainment Company. Joel’s first and second years at the recital, he was asleep, making an enjoyable concert for his parents. The next few years Joel was awake, but wanted nothing to do with that big, loud fellow in the red suit. This year, Joel was content to stand near the punch table and watch the other children visiting with Santa. Joel tipped his head to me and queried, “Is this make-believe?” Now where did he get an idea like that?! Our dear neighbor standing nearby overheard the conversation. She assured Joel that Santa has many helpers because he has to go all over the world. But Joel still wasn’t convinced he needed to sit on this helper’s lap. Just a few hours later we were watching the beautiful lighted Christmas parade on main street, and guess who was on almost every float…Santa! No wonder Joel was skeptical! I’m amazed that Joel could go from being scared to skepticism of Santa with no in-between years. Yet I am not too sad, for Jesus is the One in Whom I want Joel to believe. But it makes me wonder if some of us are the same way with God. Do we move from being scared of our Creator to being skeptical that He even exists? Today I assure you that our Triune God most certainly exists! He is God the Father, Creator of the Universe. He is Jesus Christ the Son, Savior of our souls whose birth we celebrate at Christmas. He is the Holy Spirit who dwells in all who believe. You can read His true story in the Bible, from Creation to Jesus sacrificial death and resurrection, to His eminent return. It is all true. Yes, Virginia, there really is Jesus! Today’s TEA CUPP: My dear friend, regarding our Lord and Savior Jesus, I don’t want you to be scared or skeptical, only have faith and trust. As my prayer has been for our son Joel since before he was born, I pray that you will love and follow Jesus. Climb up in Jesus’ lap today and share your heart.